I’ve started a new blog! I’d appreciate some feedback if you have the time. Thanks so much and be so blessed! For 29 days now, I’ve been trying to get this post written. January 2015 has been a full month for me— much of which has involved grandchildren. SO— there’s no better reason for this to be late. I thank God for His calling and guidance in this whole process. It was all His idea to begin with. Prayed for me regarding my book venture. Please don’t stop! Bought my books — for your sister’s 90th birthday, for your church library, for the Sunday School class you teach, for VBS at your church, for baby shower gifts, for your public school library, for your Christian school library, for your nieces & nephews, for yourself, and, of course, for your own children & grandchildren. How gratifying for me! Invited me to speak at your church or civic organization meeting about how I came to start writing and self-publishing. Told your friends & family about my books. Invited your own FB Friends to “Like” my page. Shared one or more of my posts on your own FB page. Wrote me an encouraging note about someone’s joy found in my book/s. Sent me pictures of your special recipient enjoying my books. Asked, with excitement, when a new book will be coming out. Spoke encouraging words to me about my books. Told me about an event or festival where I might sell my books. And on & on! You don’t know the important part you’ve played in my book adventure and I’m thankful to God for all of you. 2014 can go into the books as a successful year for me in this endeavor. Though I’ve not completely broken even financially, I’m almost there. It’s a good thing we don’t depend on my writing career to buy groceries & gas and that my husband has a steady job! Thank you, Guy, for being agreeable as I pursue this calling. He puts up with a lot sometimes and I appreciate him so much. AND now as we’ve entered into 2015, I’m excited about continuing on in my book adventure— with 4 books to date! For those of you who’ve asked, YES, I do plan to release the 3rd book in the series about little Jesus and the donkeys, Gil and Elpis. This book has already been written and is currently in the hands of the very talented artist, Molly Keller. Just as soon as she is finished with the illustrations, it will go to production. I’m not releasing the title just yet but I can tell you that the story focuses on the third thing that we know about Jesus as an infant and, yes, it’s recorded in the Bible. Do you know what it is? If you do, you can win a copy of His Name is Jesus today! Be the first to tell about that occasion in a comment under this post, in order to win. I am very excited about getting this book out. 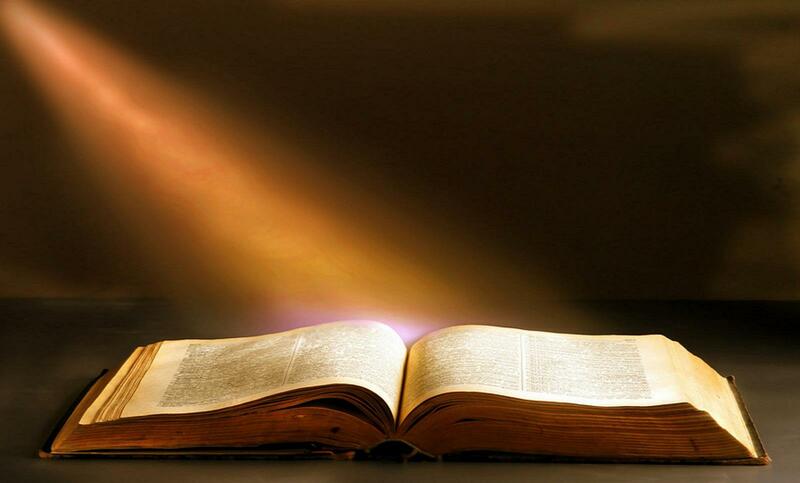 I find that most people don’t know that the Bible tells us of 3 things that happen to Jesus as an infant. Beyond the fact that He was born, and we celebrate His birthday on Christmas, folks just don’t know the rest of His baby story. Check it out! You might even win the book. In addition to the above mentioned book, I do have other writing plans for 2015— we can call them “Hopes & Dreams.” A couple of my grandchildren & a few other youngins are begging for another rhinokaroarus book. We’ll see about that. It will depend on book sales in the next few months. It’s amazing how expensive it is to do such things. I have other hopes & dreams in my heart and mind for 2015 that I’m not at liberty to throw at you yet. And, besides, this post is long enough already! Please pray for me in this endeavor. I really want to do this God’s way— so that it will honor Him and be a blessing to many. Many Happy Days to you in 2015 and may God richly bless you and all those you love! 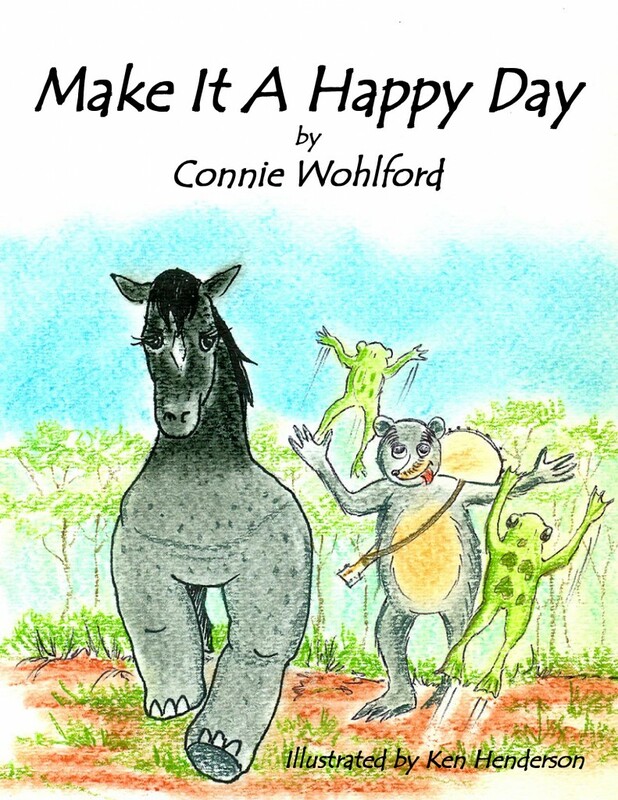 Make It A Happy Day was released in 2014 to the great delight of the children who enjoyed You’re A What?! 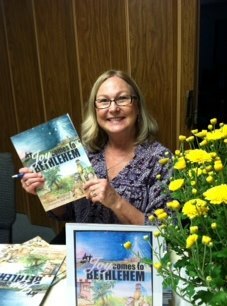 As I reflect today, I’ve included this photo taken at the launch of my first book, Joy Comes to Bethlehem, on October 7, 2012.